5 players, numbered 1-5. One ball. Pass to the next numbered player, last one passes back to #1. A plays to B who opens up and plays to C. C drives at A (passive defense only) and beats him with a scissors. offense attacks the defense and try to dribble in the endzone. Can score by passing to a teammate in the endzone or by dribbling into the endzone. 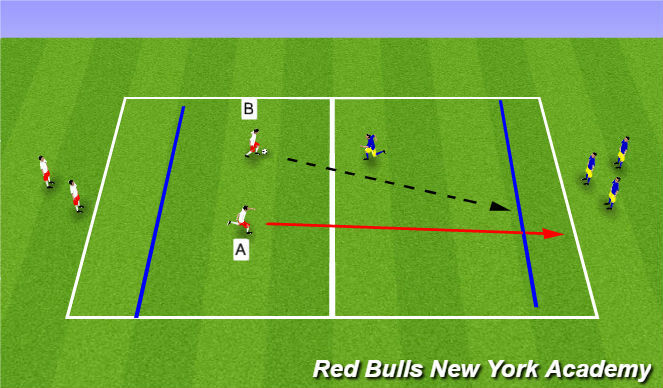 After a player scores, the person who got the assist immediatly turn and defend the attacking team (For example, if white player A gets played in the end zone and scores, Player B becomes the defender, whether the play is completed or not). Neutral wingers must pass back to field player from same team within 2 seconds, 2 touch limit. 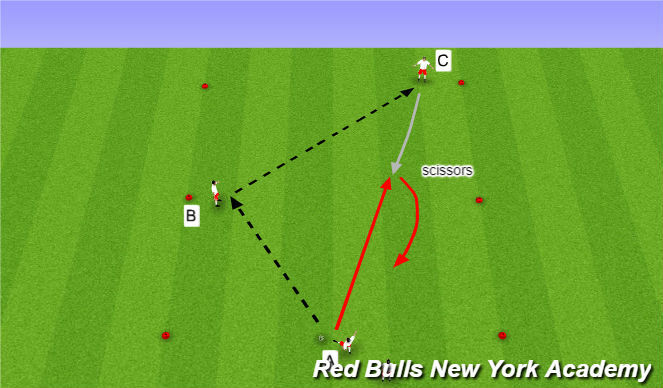 - Decision making: play the wall pass, or use support player as a decoy and throw a scissor to beat the defender? - Go to 4v4+1 open play after 10 minutes.